All in one: Efficient anti-aging skin care & advanced sun protection & immune protection. 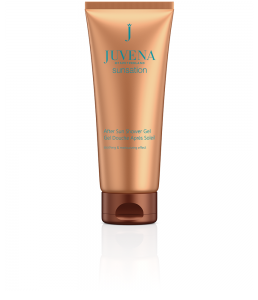 For skin that is perfectly protected and well-groomed in the sun. 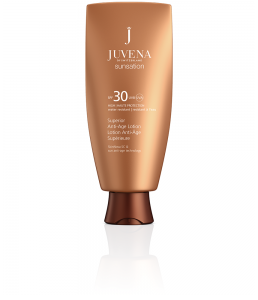 Rectify existing signs of skin aging, and at the same time offer your skin active protection against new signs of aging! How does the skin’s immune system work? Like the rest of your body, skin – your largest organ – has its own defense mechanisms to protect it against environmental pollution, stress and premature aging. THYMULEN: Thymulen® 4 is a biomimetic (from the Greek “mimetikos” – to “mime”) peptide, the structure of which is like that of the youth hormone (receptor similar to insulin). It increases the immuno-vigilance of the skin and stimulates the skin’s immune defenses. It stimulates the production of GMCSF (glycoprotein) in the keratinocytes, which in turn fosters the production of langerhans cells. Thymulen thus compensates for the loss of thymic factors – the ability of the skin to differentiate – and thus reduces premature skin aging connected with this. The epidermis receives efficacious support in its regenerative function, helping the skin to look youthful and attractive. Excessive UV radiation weakens this immuno-vigilance, and causes skin to age prematurely! FREE RADICALS: To supplement the substances that actively protect cells, vitamin E acetate is also used. For optimum, efficacious and all-round cell protection. UV filters: Chemical UV-A and UV-B filters protect the skin against premature aging (A=age) and damage caused by sunburn (B=burn) to enable you to enjoy a relaxed day in the sun, on holiday or as part of a summer anti-aging package. 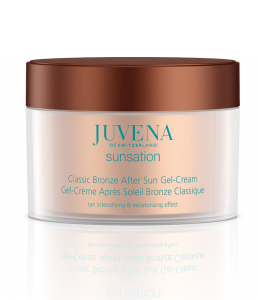 Sun draws a great deal of moisture out of the skin, drying it out, causing it to suffer from moisture deficiency, inducing wrinkles to appear and making it look pallid. The dehydrating effect of solar radiation also causes tans to peel away rapidly. Extract of caesalpinia spinosa as active ingredient. These seeds contain up to 30% oil, from which the active ingredient (hydromanil) is extracted. A three-dimensional film of moisture is produced in the skin, lavishing the skin with immediate, intensely effective moisture and compensating for deficits caused by excessive solar radiation. Lines and wrinkles caused by dry skin are immediately softened. Long-term, the active ingredient ensures the moisture exchange between the various layers of the skin is kept in balance, preventing moisture from being released too quickly from lower layers to the surface. This means in turn that the nutrients transported together with the moisture are distributed more evenly between cells, and can be utilized in a more optimum manner. Skin becomes visibly and palpably firmer thanks to the fact that all layers are moisturized intensively. 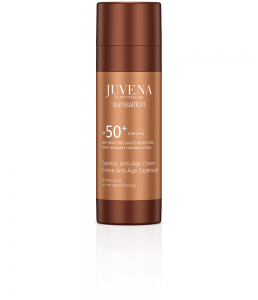 For years, Juvena scientists have researched into the processes which trigger skin aging, and have discovered that the wellspring of fresh new skin slumbers in the skin’s own stem cells, and is most decidedly dependent on the micro-environment of the cells. These insights led to the development of SkinNova SC Technology – a “double revolution” of SkinNova Technology and stem cell peptides. With stem cell peptides, it was possible for the first time ever to awaken adult stem cells from their “beauty sleep” – and to do so in such a targeted manner that they renew themselves as though at the press of a button, producing an abundance of fresh, new skin cells. SkinNova technology offers the perfect micro-environment for all cells in the skin. This enables them to develop in an optimum manner and communicate better with each other, and also means they are better organized and better supplied with the nutrients they need. 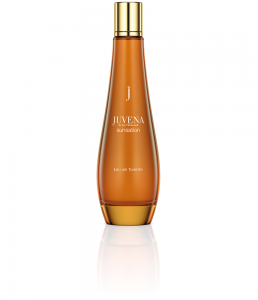 At the same time, it protects the life-long capacity of stem cells for self-renewal. This “double revolution” is a surprisingly effective and totally skin-friendly principle for cell renewal, resulting in firm, enhanced and renewed skin. The quality of your skin is verifiably improved from the inside out. The result: fresh, new skin – for women of all ages. Cathepsin G, an enzyme which is responsible for breaking down proteins, springs into increased action when skin suffers from light-induced stress, and damages the elastic fibers in the dermis. This leads to a loss of elasticity, resulting in visibly deeper wrinkles. It also triggers a disproportionate loss of moisture in the matrix and the basal membrane, which in turn leads not only to a deficit in elasticity, but also to increased sensitivity. Elix-IR is the first plant-based active ingredient known to inhibit the activity of Cathepsin G, thus protecting dermis fibers from damage caused by UV and infrared radiation (“infra-aging”). At the same time, it effectively counteracts the increased loss of moisture in the skin, and the irritations and aging factors which go hand in hand with this. For optimum protection – even in water!